Welcome to a collection of photographs of Colorado scenery. We have enjoyed summers and winters in Colorado for many years and would like to share some of the photos we have taken. 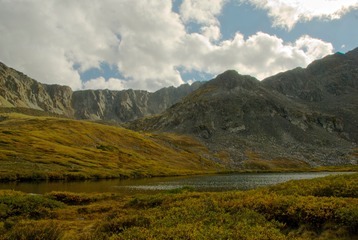 Most are from the central mountains in the area around Breckenridge and a few are from the southwest part of the state near Ouray, Rocky Mountain National Park, Indian Peaks Wilderness, and more. Click on the links at the top of the page to view summer, fall and winter shots. To see our Colorado Wildflower site, click here. Above: view of the Ten Mile Range looking west from Boreas Pass near Breckenridge. Above right: fall scene at Lower Crystal Lake south of Breckenridge.